A: When looking back at the website Mouchette.org one could say that it was one of the first fictional personal blogs, a diary of a young girl. But moving beyond that first impression, and looking at the development through the years it has become much more. What does the character of Mouchette mean to you, what does it do? M: Mouchette was about creating a form and not so much about storytelling. When I started Mouchette I wanted to use the notion of a character as something that transcends mediums, I saw the character as something that can be used as a form, or a container. Using a character as a metaphor allowed me to gather and structure information. I have always believed that a character, a person or an identity is a good metaphor. They can assume the identity of an institution without actually existing. In this sense, I see characters as containers that carry units of meaning. I was very interested in exploring that idea. At its base, Mouchette shows that identity is a social, mental, or artistic construction. It’s something that you put together. The idea that identity is one thing, ‘Me is one,’ is also an illusion, or a very totalitarian obligation. A: How did you develop Mouchette? How has it been branded through the years? M: Many things happened, depending on the works that I put up on the site, but it has never lost popularity. It has a sort of street credibility; in a way people really believed in it and the fake became reality. But the question of whether you’re a real or fake person has become less important now, which is interesting. When I started Mouchette the idea of an alternate persona was still seen as a bizarre phenomenon, so it attracted a lot of attention. Many people posed as characters, for example, mothers would go online pretending to be their daughters, but you only heard of it when they ended up in court, which seldom happened. Through the years and with the rise of popular sites like Second Life it became less and less unusual. It is quite normal to have several e-mail addresses: a work e-mail, a private e-mail, and an old one full of spam, and they represent different personalities in each of us. Everybody has these multiple identities but they didn’t create them in a deliberate way, it just happened. Whereas in the beginning the question of whether Mouchette existed or not was very important for me, I ended up revealing the true author, but only recently and in quite a low-profile way. Secrecy was a very important part of the work; it really called on the imagination of the reader, the websurfer. While designing the work I kept wondering if the receiver would guess or imagine who was behind the character. For example, I could pretend that Mouchette was a man, but how then could I play out the sexual elements without them becoming perverted? I really emphasised the secrecy and the moments of revelation. I would send a phantom e-mail and pretend that the real author had to reveal his identity and therefore I would name an actual place, a well-known art institution, for example, so that people would believe it. A: Can you talk a little bit more about these physical presentations? How did you translate the virtual work into the physical world? M: It was natural for me because I‘ve worked for many years as an artist in public spaces and galleries. It surprised me that when I started Mouchette I was suddenly propelled into the closed field of digital media. This was very limiting for me. I always wanted to present Mouchette in as many ways as possible, always with the website at the centre, and within the context of her personality. Mouchette became the brand through which I presented various projects. I think it had an effect because I know of at least two instances when I was awarded a prize and the jury discussed the secrecy of the artist’s identity, and it really attracted additional attention to the work. A: Yes, I participated in one of those discussions. 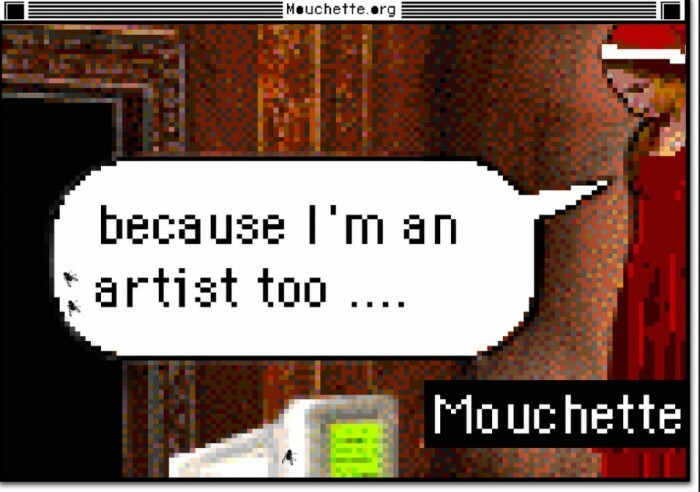 It was absolutely fascinating that after so many years, even professionals still discussed Mouchette’s true nature. M: Yes indeed, but this also happened with writers, famous writers like Romain Gary. And of course it works both ways – it has an influence on the receiver as well as on the author. Hosting another being inside yourself creates certain possibilities that trigger something. I felt it very deeply when I decided to reveal Mouchette’s secret. Mouchette enabled me to escape my grown-up self, to express myself less with words and allow the story to be told more through images. It also allowed me to share parts of my own character that otherwise would not have come out, and to acknowledge that what I wanted to achieve with my art was simply to be famous and loved by everyone. Sometimes I think that characters exist beyond us; we are merely temporal vehicles or carriers. There were often times when I wanted to get rid of Mouchette because all the work was taking over my life; in a way I was her slave. Martine Neddam the artist was taken over by Mouchette the character, which didn’t even belong to me. Mouchette first appeared in 1937 in a book by Georges Bernanos. Later, in 1967, Robert Bresson made a movie called Mouchette, about a French teenager who commits suicide after she is raped, and I loosely based Mouchette.org on these characters. Others have also used Mouchette.org. So it’s come from somewhere and is going somewhere else and I’m the carrier in between. A: Is this, for you, also a space where playfulness and irony come into play, the fun side of doing things? Something that is reflected in the projects you create, the coding, the tricks, but also on a conceptual level, a play with language, an urge to transform things, and push limits? M: Yes, absolutely. It all started with the use of English as a foreign language. In the early days of the Internet people communicated in text spaces, the MOO [ed. MOOs are network accessible, multi-user, programmable, interactive systems, used for the construction of text-based adventure games, conferencing, and other collaborative software and communication platforms]. When I talked with people, I would tell them that English was not my mother tongue, but they would forget this quite quickly, and then my language would come across as very childish. So, there I was in the MOO communicating with MIT people, who were really academic, working on code and text. I was interested in talking to them through a sort of playful interface, which the MOO was. I had this awkward feeling that they would soon forget my ‘accent’ and after two sentences I was just communicating in baby talk, while they were using academic language. Quite unconsciously I was training myself to find simple way to express complex ideas without emotional barriers. So I decided to take that strategy further with the creation of an online character, Mouchette, who is emotionally very direct but still can communicate ideas about art. This experience was very liberating for me. If I had used my mother tongue it wouldn’t have worked because, like every educated adult, my emotional inhibitions are very strongly rooted inside the language. Using this kind of direct language in a specific way triggered something in me I didn’t know I had. For example, I would say simple phrases like ‘Art is what you say Art is’ using the ‘Duchamp approach’ in a very cheeky way. If I had expressed it in French, I would have used more complex language. Mouchette gave me the opportunity to leave intellectual authority behind. This was important because I wanted to reach another audience that was present on the Internet and move beyond the art gallery and the institutional scene. For me the irony revealed itself through the aesthetics of the site. Perhaps I can explain it with something I used to say: ‘Can you be pink and conceptual at the same time?’. In the 1970s and 1980s artists from the Art & Language and conceptual art movements were very style driven, even though they pretended that appearance and personality were insignificant. But when look back, it was elegantly black and white, very stylish. Pink at that time, and even now in many cases, wouldn’t be acceptable. Pink is frivolous, not serious; it’s playful and certainly can’t be conceptual or political. Sometimes this attitude towards the non-pink in art makes me very angry. For example, Mouchette would never be called a political work of art, or even art that engages with the social. At best many art critics and curators see it as a funny little story, non-political and not socially engaged. This has annoyed me at times, because it is political and it does engage with the social on many levels. The idea of alternate identities is very political, as are the notions of multiple identities, and shared identities, which I provided through Mouchette. It’s even more cynical because I’m perhaps one of the few artists who have had to deal with the legal system when I was taken to court. But I also never claimed that it was political or social. I don’t think that’s my role, and it’s not the way the work functions either. A: Mouchette seems indeed to elude the radars of politics, new technologies and networks, which is regrettable. M: Yes, it is, but with Mouchette I wanted foremost to create a social space, a space where people could communicate and help other people. Of course, that these things have been sorted, edited and published is in itself a political act. It’s still a sort of repository of thoughts and emotions that wanted to be shared, and finally have been shared. Mouchette shows that art can penetrate people’s private lives, and I believe that is a good thing. M: As soon as I had a mailing list of 20 people I named this list a Fanclub. Over time I noticed that the number of visitors kept growing and that the audience also changed. New people keep on discovering the site. I believe that it’s because of Mouchette’s youthfulness, her combination of energy and anger that is also present in classics such as The Catcher in the Rye. People recognise and identify with Mouchette. For me the Fanshop is a continuation as well as a new step. I like the idea that it is situated in real life. It’s another interesting form for making contact with people. I try to investigate the Fanshop as a social form and an artistic form, including the notions of fake and real. And again, it plays with the idea that an identity can be shared and also be used to offer a platform for different ideas and groups of people. A: How do you balance between the idea of Mouchette as an identity and as a space where social exchange can take place? M: The Western world has developed a very limited form of identity, I think. We believe that we can own ourselves, which is absolutely untrue. You’re always a part of something and you switch between different identities. The Western idea of identity needs to be re-examined. I was very aware of that when I created Mouchette. I didn’t want to describe someone, but I wanted to re-examine the conditions of identity as a form of social exchange. I’ve always seen Mouchette as a platform, not as an identity. It, or she, allows me to raise certain issues and also allows others to do certain things. It’s a platform of exchange. A: And not just of ideas, but also the sharing of identities? M: Yes, I wanted to put forward the idea of identity as a composition. As I said the notion of a single identity is very artificial; furthermore, whatever identity you do have does not necessarily only belong to you. Its also part of, or even belongs to, everyone who interacts with it. Whatever you do to yourself, for example, if you cut your hair and a friend comes by the next day and is surprised and makes some kind of remark, then that remark could be understood as: ‘You changed yourself without my permission’. I very much like the idea of identity as something that is shared. So I created an identity-sharing interface that made it possible to use or copy Mouchette. Unfortunately, it backfired after the terrorist attack in New York in 2001. I was creating David Still at the time, and was very excited about inventing another character that could be taken over by others. But after terrorism struck, anything that dealt with other identities became suspect. Terrorists could hide behind my characters. Each and every façade was suspect. What was once playful and seductive was made into something to strike out at, something to erase. I really felt that the attack on the Twin Towers and the way America reacted to it threatened my art. A: How do you see in this light the rise of Facebook? Do you think it might become a way of dealing with different identities again, or a place where people can play with identity? M: No, exactly the opposite. The whole idea of alternate identities was banned on Facebook. Someone had set up a Facebook page for Mouchette but Facebook shut it down very quickly. They do accept the pseudonyms of famous writers, but if you create three different people with three different e-mail addresses, at some point they will become suspicious and shut down the pages. I’m not entirely sure how they track everything, but building alternate identities is definitely discouraged. Facebook actually started as a virtual dating site, so it’s based entirely on the concept of real identities. If anything, it reinforces the very limited idea of a single identity. A: What is Mouchette’s next adventure? M: I’m still fascinated by made-up characters, especially those that people accept as real. In this line I just finished a work ‘Turkmenbashi, mon amour,’ an animation in which Mouchette shows us Turkmenistan and highlights the presence of its ex-dictator, the late Saparmurad ‘Turkmenbashi’ Nyazov. Even though he’s dead, his personality is still very prominent in the capital, Ashgabat. The city is home to numerous huge golden statues and images of this extremely repressive dictator. At the same time there is a strange atmosphere of non-communication. That tension between his ubiquitous ‘presence‘ and the silence about it was something I wanted to address. So I made a sort of reportage, a documentary with photos and texts, where Mouchette describes and comments in her typically playful and ironic way, addressing the dictator as if she admires him and writing a love letter starting with ‘Turkmenbashi Mon Amour’. Here the play between fiction and reality is to identify these fictional elements in reality, like these crazy self-promoting dictators who are really fictitious characters. I think I’m bound to continue experimenting with fictitious characters in many different ways, with the ones I invent and with the ones who are already here among us. Once you’ve created one, you realise that our lives are full of them. They are like an army of shadows.